Twelve Nepali guards working in Kabul were killed in a blast on Monday morning. 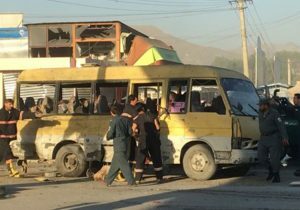 The Taliban suicide bombers attacked a minibus that was carrying the Nepalese guards and others killing 14 persons in total and injuring seven others. Ministry of Foreign Affairs confirmed the killings of Nepalese and revealed the identity of those killed. The guards were told to be heading towards the Canadian Embassy on regular duty. Kabul killings came as the repetition of the Iraq incident of September 2004 when 12 migrant Nepalese workers were brutally killed by the Iraqi rebels. Former King Gyanendra Shah has expressed deep sorrow on the killing of Nepali citizens. Prime Minister K. P. Oli and leaders of all parties condemned the killing. Indian Prime Minister Narendra Modi also condemned the attack and assured Indian support to help the Nepalese. Foreign Affairs Minister Kamal Thapa apprised the Legislature Parliament of the killing on Monday afternoon. War-torn Afghanistan has in recent years emerged as the most popular destinations for the Nepalese migrant workers as they get higher salary there. Mostly the men who served in the Nepal Army and Nepal Police reached Afghanistan to work as security guards for the American and other western companies. According to the Foreign Ministry, the deceased Nepalese guards were Chandra Bahadur Magar of Kathmandu, Amrit Bahadur Thapa (Lamjung), Damabr Bahadur Tamang (Nuwakot), Krishna Bahadur Dhungana (Chitwan), Suk Bahadur Gurung (Syangja), Jitendra Singh Thapa (Rupandehi), Madhusudan Koirala (Nuwakot), Bir Bahadur Kshetri (Kathmandu), Lil Bahadur Gurung ( Nuwakot)Navin Bahadur Chhetri (Parvat), Ankur Tamang (Sunsari) and Hari Bahadur Kshetri of Kathmandu. Likewise, the injured Nepalese included Prem Chettri of Morang, Chet Prasad Srrchan of Myagdi, Kumar Bahadur Gurung of Gorkha, Man Bahadur Thapa and Krishna Bahadur Deuja of Chitwan, Amrit Rokaya of Surkeht and Chyangwa Tamang of Nuwakot. Meanwhile an AP report added: The Nepalese were on their way to the Canadian Embassy where they work as guards when the explosion took place on Monday morning, according to a Nepalese guard who was wounded in the attack. Officials at the Canadian Embassy in Kabul could not be reached for comment. In the bombing that killed the Nepalese, the bomber was on foot when he struck the minibus, said Gen. Abdul Rahman Rahimi, the city’s police chief. He did not identify the foreign security company the guards work for. The Interior Ministry confirmed that all 14 killed were Nepalese citizens, describing the attack as the work of a “terrorist suicide bomber.” It said the explosion also wounded nine people, five Nepalese employees and four Afghan civilians. Next Has Nepal-India relations normalized?